Last Days of Shoreditch, the night market on Old Street, is back for a winter season, opening on Thursday 23rd November 2017, open Thursday to Saturdays (& selected Sundays). 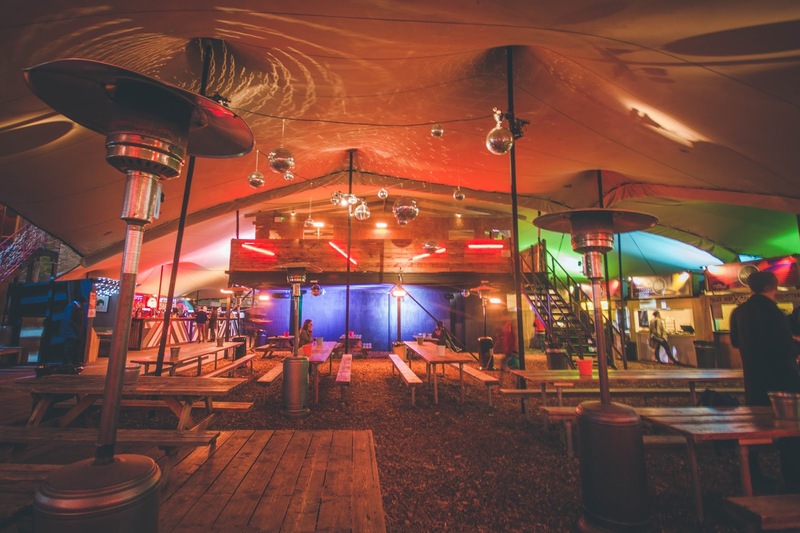 Food comes from such streetfood stars as Cheeky Burger, Smokey Tails, and the vegan Biff's Jack Shack, and there will also be bars, Lucky Voice Karaoke, DJs and more. Be there! "Last Days of Shoreditch Winter La La Land has arrived back in the heart of East London with a sensational winter programme of roaring fire pits, incredible Ernest Hemingway inspired cocktails, delicious food, and an intimate dance floor, all under one big roof and soundtracked by a star-studded DJ line-up. Expect winter warmer cocktails and craft beer bars alongside mouth watering street food lineup from Smokey Tails, Biff's Jack Shack and Cheeky Burger. 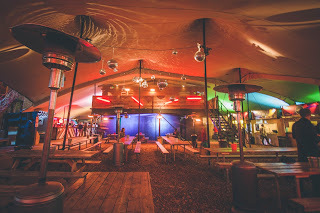 Last Days of Shoreditch Winter La La Land now boasts a fully covered and heated indoor seating area, alongside its karaoke room powered by Lucky Voice and private spaces available to hire making it the ideal spot for winter hedonism. Last Days Of Shoreditch Winter La La Land is open Thursday to Sunday with further information via lastdaysofshoreditch.co.uk. Last Days of Shoreditch Winter La La Land are also over the moon to announce that Smokey Tails will be completing the team for winter. Created by DJ Seth Troxler, Wilderness festival co-founder Jo Vidler and flavour technician Jona Ahearne, the cult East London pop up will be serving their delectable takes on classic American breakfasts, including Mama T's Pancakes and crunchy brioche French toast. Stay tuned for more information on Smokey Tails' Winter La La Land bottomless brunch offering very soon. Drinks aplenty as the old fashioned Stirred Not Shaken bar will house Ernest Hemingway inspired cocktails including Sazerac, Old Fashioned, Negroni, The Godmother, Hemingway's Bellini and many more timeless classics. Meanwhile the Winter La La Land Hot Bar Guava & Orange Mulled Wine, Spiked Pepper Mulled Cider, Baileys Hot Chocolate, Irish Coffee of Kings will be on hand to warm those winter nights. Last Days of Shoreditch Winter La La Land is open every Thursday, 5:00pm – 11:30pm, Friday 5:00pm until midnight, Saturday 5:00pm until midnight, and selected Sundays. situated on the corner of Old Street and Great Eastern Street. Entry is free with limited £5 tickets offering queue jump and a complimentary winter cocktail."